Shigeru Miyamoto is a Japanese video game designer. He co-created the Mario, Donkey Kong, The Legend of Zelda, F-Zero, Pikmin and Nintendogs franchises for Nintendo game consoles, and mostly works on games as a producer. He has also supervised many titles published by Nintendo on behalf of other developers, including Metroid Prime and Mario & Sonic at the Olympic Games. 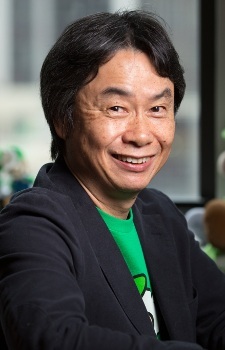 Miyamoto is a world-renowned game designer, and has been called the "father of modern video games" and "the Walt Disney of electronic gaming" Video games designed by him typically feature refined control-mechanics, intuitive gameplay, simple story lines, and imaginative worlds in which the players are encouraged to discover things by themselves. Employed by Nintendo as an artist in 1977, he was given the task of working on one of their first coin-operated arcade games. The resulting title was Radar Scope, which was not as successful in the United States as Nintendo had hoped. Miyamoto later reused the game's hardware and modified it into Donkey Kong, which was a huge success as well as a turning point in video game history. The game's lead character, Mario (then called Jumpman), became an easily recognizable video game character and Nintendo's mascot. Miyamoto quickly became Nintendo's star producer, designing many franchises for the company, most of which are still active. This people is what you call a legend. The Legend of Zelda = One of the best game franchises in the world. Started the best series of all time, and ruined some of the best series of all time as well.